It feels like we’re on the verge of something — “feel” being the keyword. Personal computing has more or less been the same for a few decades now. It’s the mouse, the keyboard, the monitor, and the machine. With things like notebook computers, this has been altered a bit, but it’s the same basic idea. But with the rise of smartphones and now tablets, the whole concept is finally starting evolve. And it looks like OS X Lion will be a key to this transition. On stage last week during their Back to the Mac event, Apple gave a sneak peak at some of what they have in store for the next version of OS X. Of note, CEO Steve Jobs made it very clear that it has been born out of the concept of “OS X meets iPad”. In other words, OS X meets iOS, Apple’s touch-based operating system. 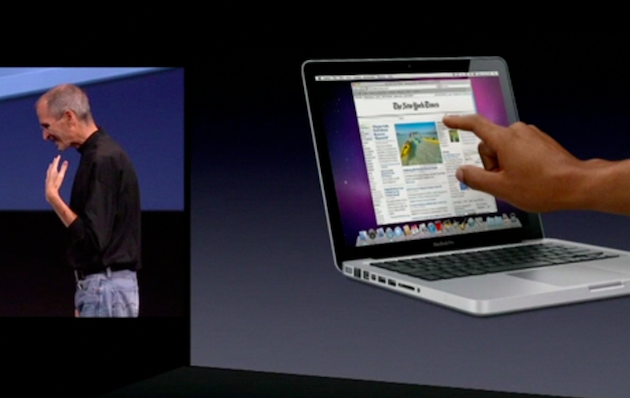 Jobs also made it clear that Apple wouldn’t be creating touchscreen Macs anytime soon. Noting that these concepts “give great demo”, he also said that extensive testing over the years have proven that touching a vertical screen just isn’t ergonomically sound. Instead, Apple has committed itself to developing products that will allow them to use touch elements on the screen, without actually touching it. In their MacBooks, the multi-touch trackpads are built-in. 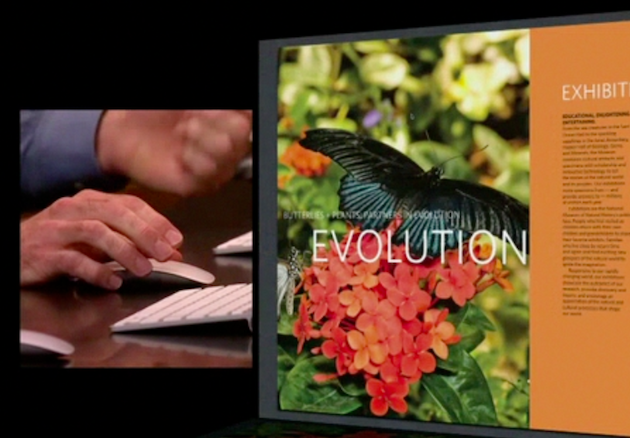 For their desktops, the Magic Mouse and the Magic Trackpad were created to bring multi-touch to all Mac users. Obviously, neither of those products was an accident. As we’ve noted before, Apple is ushering in an era of touch, and each of these things are key for such a transition. Now, with the features in OS X Lion, we’re going to see touch concepts fully baked into the traditional operating system for the first time. Sure, Apple has included certain multi-touch options in OS X for some time now; first for MacBook users with multi-touch trackpads, then for Magic Mouse and Magic Trackpad users. But all of these are basically tacked-on shortcuts of sorts for stuff you normally do with mouse clicks. 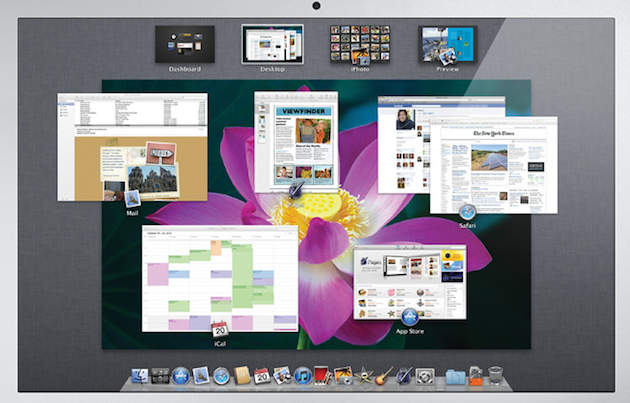 Some of these newer OS X Lion features appear to be fully thought-out with multi-touch in mind. As Apple VP of OS X, Craig Federighi, demoed on stage last week, to navigate new features such as full-screen apps and Mission Control, it’s no longer point & click, it’s flick and swipe. It’s a two finger flick to the left or right to travel between full-screen apps — and back to your desktop. Interestingly, it’s also now a two finger flick to the left from your desktop to get access to your desktop widgets (it would appear that they’re no longer overlaid on your actual desktop). To enter Mission Control, it’s a three finger swipe down. To get a preview of many open windows in Mission Control, it’s a two finger swipe up. Yes, pointing and clicking can still be involved for some of this, but it seems that it’s more of the fallback now. Undoubtedly, there will be keyboard shortcuts as well, but again, as a fallback/power user option. And I can’t help but wonder if the trackpad “Tap to Click” option will become the norm one day in the not too distant future. And as you may have noticed during his demo, Federighi had trouble a few times launching into Mission Control on the Magic Mouse. Part of that was because he was nervous, but part of that is also because while multi-touch is a nice feature on that device, the surface isn’t big enough for more advanced gestures. But the Magic Trackpad (and MacBook trackpad) is perfect for those. Remember that there are now more Mac laptop users than Mac desktop users. This trackpad multi-touch manipulation is the future. Given the little we know about OS X Lion so far, I’m already much more excited about it than I was for OS X Snow Leopard. To me, it seems clear that Apple is going to use this new OS to begin the transition to the golden age of touch computing. I can’t wait.